Smile By Nature Men's Cotton White Full Sleeve Shirt_(EONESHL026)_X-Large@899 Rs [Mrp:-899] - Onlinedeals.discount - A leading product discovery website. Find the true prices of products, read reviews and buy top brand products at reasonable prices. 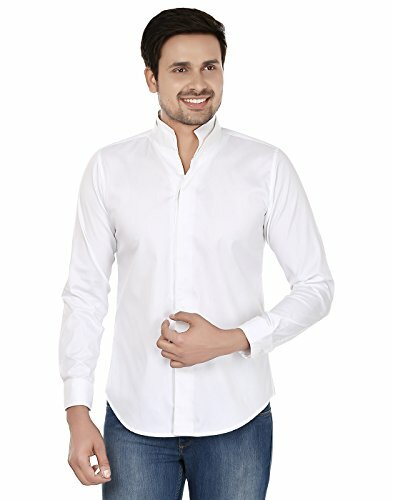 Enhance Your Wardrobe Collection With This White Colored Shirt From The Reputed House Of Smile By Nature. This Shirt Is Styled In Full Sleeves And Has A Chinese Collar To Flaunt Off A Casual Look. Made From A Premium Quality Cotton Fabric, This Piece Of Cloth Is Sure To Offer The Ultimate Comfort And Ease Of Wear. Team It Up With A Pair Of Trousers For A Complete Look. Go And Grab It Soon.